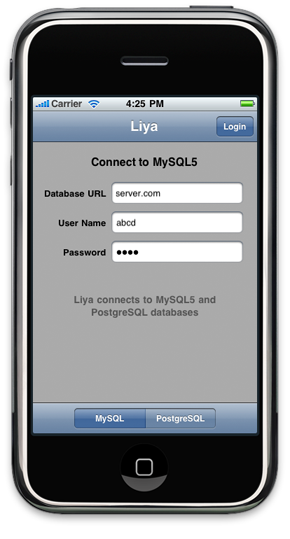 Liya connects to MySQL and PostgreSQL databases, and allows iPhone users to access and edit the database contents. It's a free download. The latest version is 1.1.3. 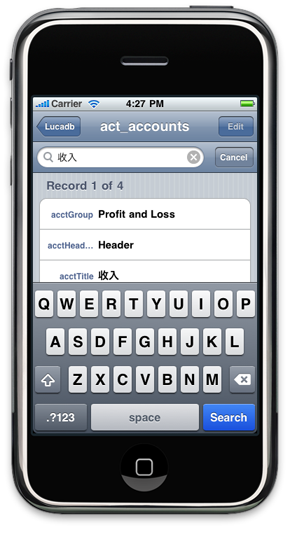 It supports multi-lingual data entry & search and iOS4 multi-tasking. There is also a Liya for the iPad on the App Store. Need help setting up MySQL and PostgreSQL databases? Use Liya on the Mac. 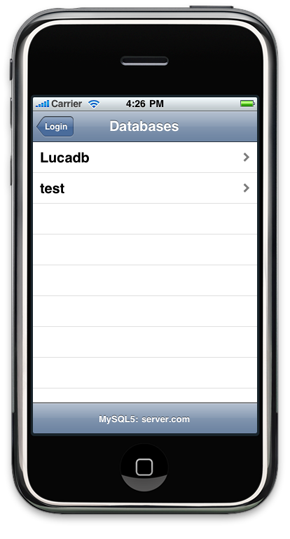 Choose either MySQL or PostgreSQL, enter connection parameters and tap the Login button. 2. 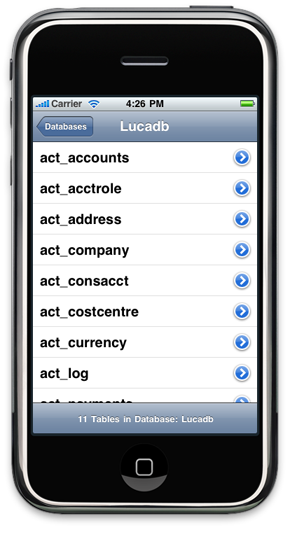 List of Databases. There are two here and the user selects Lucadb by touching it. 3. 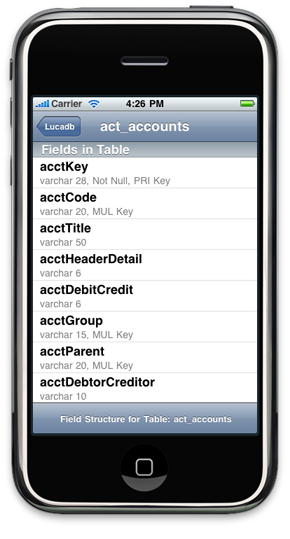 Tables in the selected Database. 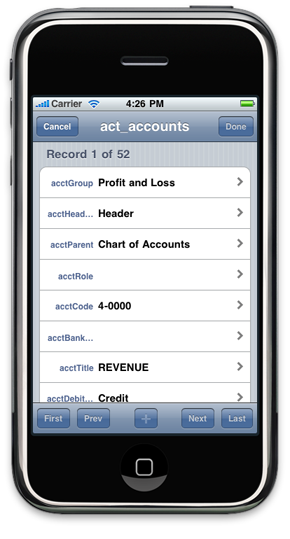 Tap on the blue detail disclosure button to see the data structure. Otherwise you'll get the contents. Examine the table's data structure. You get here by tapping the table's blue detail disclosure button. 5. Data in the Table. Examine the table's contents, 10 records at a time. Move forward and backward in batches of 10. 6. Edit Mode. Turn on Edit Mode to change the data in the individual fields. 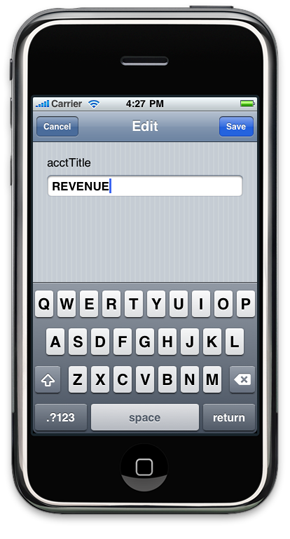 Tap Done to save, else Cancel. Edit a single field in the selected record. Cancel to abort the edit. 8. Search. 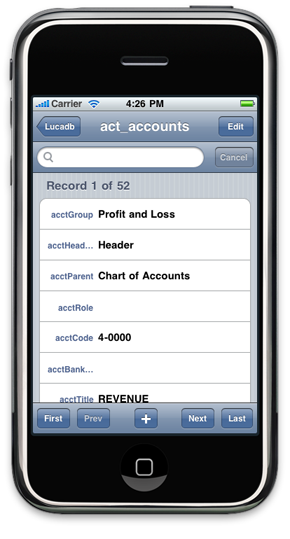 Search text fields to limit the number of records retrieved. Supports multi-lingual text entry. 9. Connecting to PostgreSQL. Liya works the same way with PostgreSQL.